Add all the ingredients to the chicken and marinate for 20 to 30 minutes. Take a pan. Add oil, Worcestershire sauce, Balsamic vinegar, Chilli Garlic Tabasco sauce, Chocolate, Soya sauce, Salt to taste, Star anise and stir the sauce. Cook it on low flame and give it a boil. Add the roasted sesame seeds. Cool the sauce and add it to the marinated chicken and keep it for another 30 minutes. Boil the vegetables except for the capsicums in hot boiling water for 5 minutes. Draine the water out and pour ice cold water on the vegetables. Take a pan add butter add all the vegetables and stir fry. Sprinkle salt and pepper. Add all the ingredients to the mashed potato and mix it well. In a pre heated oven bake the chicken for 45 minutes covered with foil and rest open for 10 minutes at 200 degrees. 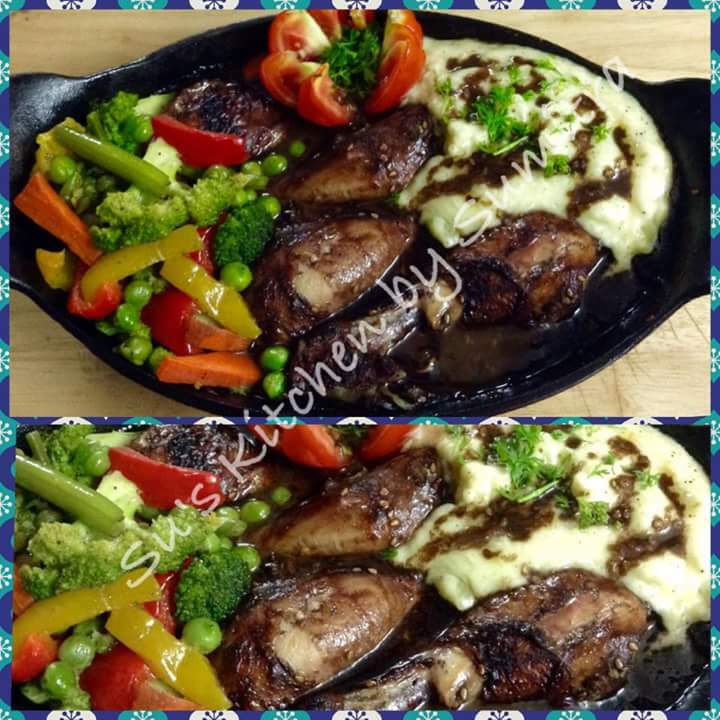 After the baking is done serve the chicken with mashed potato and Stirred Vegetables. Garnish it with tomato. Have it with bread as a whole meal or snack..
All in one baked Egg Casserole..